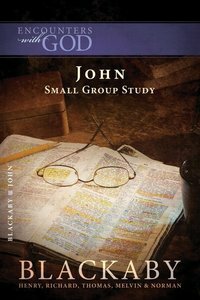 About "John (Blackaby Bible Basics Series)"
Henry T. Blackaby is the founder and president emeritus of Blackaby Ministries International, an organization built to help people experience God.Dr. Blackaby has devoted his lifetime to ministry. He has served as a music director, education director, and pastor in churches in California and Canada, as well as president of Canadian Baptist Theological College for seven years and president of the Canadian Southern Baptist Conference. Blackaby has published an array of spiritually influential messages in his lifetime, most notably Experiencing God: Knowing and Doing the Will of God, which has sold 4 million copies and has been translated into over 45 languages. His books, Experiencing God Together and Experiencing God Day by Day Devotional, both won the Gold Medallion Award.- Publisher. Order now to secure your copy when our stock arrives. Other edition is available. 9781418526535 0 Available. Expected to ship in 6 to 7 weeks from Australia.